With much of the Rocketman Florida Triathlon occurring inside the secured areas of the Kennedy Space Center and in the tree-lined waters of the Indian River, spectator viewing is restricted and fairly limited. Our transition area is large, and spectators will have excellent viewing opportunities to see entrants ready for the race, exit and return from the bike course and leave for the running leg of the race. Transition Area is in the field immediately south of the parking lot at the Astronaut Hall of Fame. Athletes will utilize the same set of steps both in and out of the water, and the shoreline is heavily shrouded in trees and brush so swim course viewing is very restricted. Spectators will not be allowed near the swim corral as space is limited. Rocketman Florida Spectators may walk along the grass aside of SR 405 to the empty parking lot about 100 yards east of the Astronaut Hall of Fame to see the mass of swimmers, but individual viewing will not be an option. Stopping or standing along SR 405 is not allowed by NASA so the only opportunities to see athletes on the bike leg will be as they enter and exit the main transition area and SR 405. Since the run occurs in the same stretch of road as the bike leg, there will be very limited opportunities for spectator viewing. Runners can be seen both leaving and entering transition and the Vector Space Park area, with the best opportunities for viewing being in the home stretch toward the finish line. On the wide and shaded Vector Space Blvd., spectators will have a great view of seeing friends and loved ones cross the finish line. 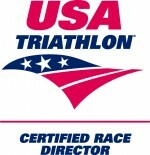 The finish is located adjacent to and just south of the transition area.